The seminar ended more than 24 hours ago but up to this moment, I can feel the resounding beat of my heart. It shouts my desire to become a millionaire someday - at my thirties. Why desire to become wealthy? to become a millionaire? Because I have a dream - That time will come when I don't have to worry about money. It's abundant, it will no longer become a concern for me so all I can focus on are the most important things: to spend quality time with my loved ones, to build relationships with other people and to affect others in a fruitful way, to serve God with all my strength, and to live happily and worry-free. Whew! Writing those dreams and imagining that those will happen brings fire from within me and puts a very wide smile on my face. I love this feeling. It brings positive vibes all over me. I guess this is the after-effect of attending Bro. 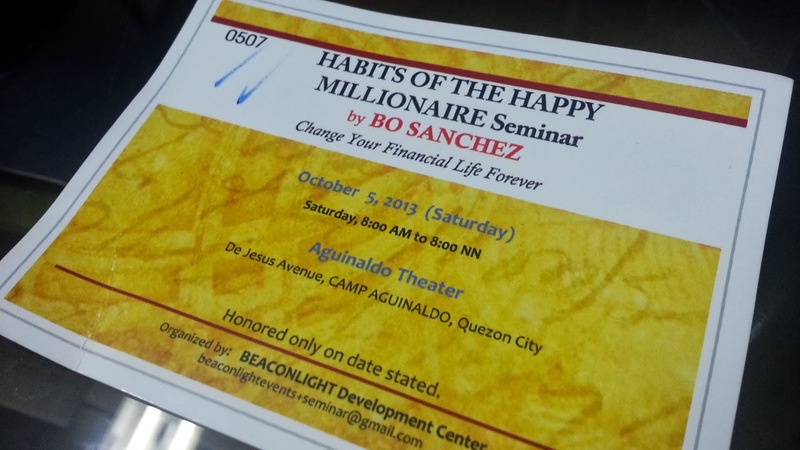 Bo's seminars. Haha. The first habit lets you ask, think hard and realize what your wealth really is. Bro Bo made us define our wealth. It made me think what really matters to me and I know it's not money but my loved ones and of course, my ultimate boss, God. After defining your wealth, he digs in to your deepest frustrations, trials and dreams. He told stories of failure and how those failures brought out the millionaires/billionaires in him and other successful entrepreneurs he knows. Those failures became their emotional why and I found mine to be my painful experiences, ongoing trials and ultimate dreams. After the two habits, he then attacked our beliefs..our perception and actions towards wealth with the 3rd and 4th habits. He mentioned habits that we should get rid off like the Haciendero Complex, Bahala Na Attitude, Lotto Culture and Manana Habit and the mindset that money is hard to earn or to get. Instead, we should always think that "Money is Everywhere" and God gave us the capacity to produce wealth. We should be aggressive to become wealthy. Every one of us is interested to become wealthy. But more than being interested, it's the commitment that matters. How committed are we in getting wealthy? A question I asked myself after the discussion of this habit. The fifth, sixth and seventh habit give idea on where to start your road to being a millionaire. Successful people shared their stories. Steve Tamayo, owner of Tamayo's Catering Services and Restaurants, impart his inspiring life experience. Maves Angeles and Ivy Sepe, both happy missionary millionaires, also gave their pieces. These three people have a common denominator - they came from poor family but that didn't stop them from creating money machines that made them happy millionaires. Bro Bo mentioned 2 kinds of money machines - manual and automatic. What we should aim is the automatic money machine. Something that gives you income even if you are not working for it anymore. Paper assets is one of them. Bonds, mutual funds or the stock market ares samples of money machines. Income from Multi Level Marketing is also an example. Apart from creating money machines, we should also learn to control our cash. Spend 70 % and invest 30% of your income and STOP BORROWING! Yeah, I'm shouting. Also, to attain success, we should stick to our game. Know where you are very good at, forget your weaknesses and do something that you really love. That's my take home in this habit. Last, but not the least, pass on your wealth. Share the blessings because when we die, we cannot bring anything that we had on Earth. We die broke! So while we can - give. While we are alive - share. At the end of the seminar, tears were falling down my face while singing worship songs. I felt all the trials and pains but I thank God I have all of those because I had motivation, I had reasons to pursue my dreams. Overall, it was a fantastic seminar. It's LOADED! Packed with spiritual uplifting, humor, realization, motivation, inspiration.....a free book (The Turtle Always Wins), an autograph from Bro Bo and a picture with him, and all of these, I got for only 975 pesos! What a deal! 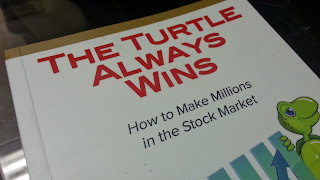 My Free Book "The Turtle Always Wins"
If you want to be blessed with these kind of seminars, I encourage you to join Truly Rich Club. Truly Rich Club members receive announcements on Bro Bo's seminars before everyone else. Plus, if we register earlier, we get an "Early Bird" Discount. The original price of the seminar is 1275 (For VIP tickets, it's 1475 - you are given the front seats plus you get free autograph book). If you bring along someone with you, they will be given the same rate as you had as an "early bird" truly rich club member. In this case, it is also 975 pesos only. So if you want to receive these discounts and updates, join Truly Rich Club. Be ahead of others, act now and experience the blessings and perks of being a Truly Rich Club member. Hi Cath I really want to join. I received an invitation thru email. How's the mode of payment ?It is not indicated there. I already sent an email to the e-address they provided for signing up, but got no reply .Early bird promo is until May 10 only.